If I had to name one shotgun a best buy, it would be Beretta’s BL line of OUs. These guns were imported into the US in the ’60s & ’70s by the Garcia Corporation. With various degrees of engraving and a touch better finishing, I think they’re a bit more refined the 686s Beretta offered in years later. This first Beretta BL is a BL-3 in 28g. It’s listed on Gunbroker.com at No Reserve, and the auction ends on 10/25/2015 5:58:16 PM ET. Rare Beretta BL-3 28 ga. O/U: Arguably the finest Box Lock Beretta ever manufactured. This rare 28 gauge is choked S/S. Barrels measure a tad over 26 in. Length of pull is about 14 inches from the pachmyer pad (done right) to the trigger. This beauty is in Excellent condition. I am including a reprint of a Garcia Imports magazine featuring the shotguns from Beretta dated from 1969-1970. A true quail destroyer! This next one is 20g BL-4. It’s also listed on Gunbroker.com at No Reserve, and the auction ends on 11/1/2015 8:00:00 PM ET. 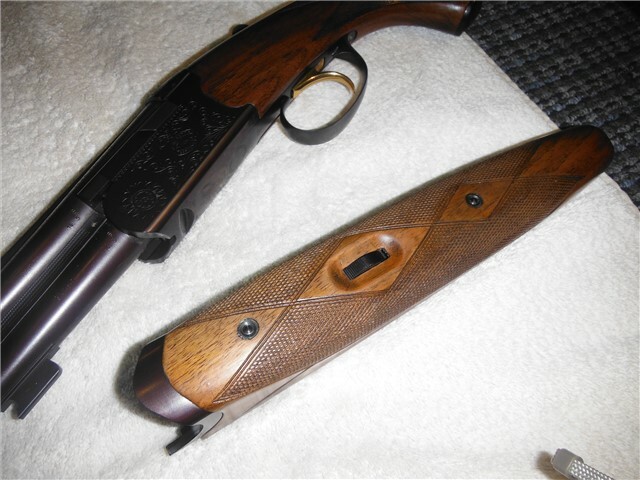 Beretta BL-4 O/U 20 gauge, 20 ga, 26″ bbls: Really nice Beretta BL-4 over/under 20 gauge. LOP at 14&1/8″. IC & Mod barrels. Takes 3″ shells. $45 shipping via USPS priority to FFL. Sales to California okay with prior permission from your FFL. This last one is a BL-5 in 20g. This one is on Gunbroker.com, but it’s being offered at a fixed price: $2,475. That’s a lot, but I’ve seen very few BL-5s. If you have to have one, here it is. 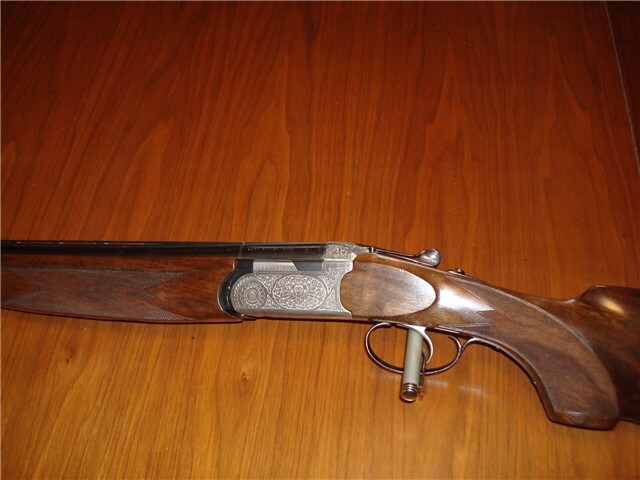 BERETTA BL-5 Over Under, 20g, 27″ bbls: This is a rare, and highly sought after Beretta BL-5. Please do not confuse this with the S-57 models. Each is clearly marked on the receiver. Some individuals would have buyers believe they are the same. They are not. The BL series is the finest box lock guns that Beretta ever made. This example has a 27″ barrel, vent rib, single trigger, and gorgeous wood. The chokes are F/M. Interesting, the top of the over barrel isn’t as tall as the top of the receiver. First I thought maybe they used the same receiver for 28 and 20 gauge barrels. But the 20 gauge barrels fit the same way. I’ve never seen this, where the top of the top barrel is not flush with the top of the receiver. Maybe the receivers are designed for 12 gauge and they use the same one on their sub-gauges? It’s strange you just wrote this since it hasn’t been long since I fell in love with these guns. These are true gems and arguably nicer handling than the later and new 680 guns that came after. They are to me, and I love my 687 28 gauges more than anything I own. Now the secret will be out. Just discovered your site as well, and will be back for sure. I love all this stuff to distraction. Thanks — glad you like it. Keep checking back. I don’t know why they’re like that, but they actions would have to have been scaled down. If they weren’t, the 20g & 28g would be heavy – probably heavier than the 12s. If the 28gs were using 20g actions, they would also be heavy guns. I’m not sure if the 28g action is scaled down in every way, but compared to the 20g it must be smaller in some ways. So much for my love affair with this one. Seems I need a new cocking rod for the bottom BBL and the best sources aren’t sure where to find them. Not for 20 Ga anyhow, although there seem to be a few 12 Ga parts around. These rods are completely different than those on the 680 series guns, which Ironically are more like the old ASE rods. These are vastly different, and perhaps its the reason they didn’t keep going with them. After a search, I found a member on one of the forums with the same problem as me here, so it seems logical to surmise this is why this design didn’t continue. It’s a little disheartening, but I’m lucky enough to have another Beretta I love, so it’s not all bad. In reply to Bardin, the frames are certainly scaled to a proper 20 size, and the top of the rib not meeting flush with the action is just the way they are. It’s not bothersome to me, but if you’re particular about such details, it might bug you. I can’t say, but I imagine they used this same (20) frame for the 28Ga BL4 guns. They are certainly small enough, but I just can’t say for sure about those.